The Mitsubishi Outlander is a compact crossover that can be a good choice for families looking for an affordable, roomy and comfortable SUV. The Outlander has available all-wheel drive, choice of two engine sizes, attractive styling, and third-row seating that separates it from its competitors such as the Subaru Forester, Honda CR-V and Mazda CX-5. The Outlander, whose platform is based off the Mitsubishi Lancer compact sedan, was first introduced in the U.S. as a 2003 model. It was Mitsubishi’s first crossover, offering the utility of a larger vehicle with the driving dynamics of a smaller car. Mitsubishi lagged its competitors in introducing a compact crossover and the automaker tried to set the model apart by offering a sportier demeanor and distinctive styling. A much improved and all-new Outlander debuted in 2007. Since then, the Outlander has grown wider and taller, while becoming more fuel-efficient. The model has been a success for Mitsubishi, selling nearly 1,000,000 units worldwide since it debuted. It was also known as the “Airtrek” overseas. Mitsubishi hopes that the 2013 Outlander changes will keep the model’s sales going strong. The Outlander hasn’t been altered a whole lot since 2007. That will change a bit in 2013 as the Outlander will feature a more horizontally oriented front grille. The model’s chassis is also being modified and a new 6-speed automatic transmission is being offered, which should help boost fuel economy. The model will also be lighter in weight and offer new interior features. Check out the Mitsubishi Outlander’s official website for more information. There are not expected to be much in the way of changes for the Outlander’s engine for 2013. The 2012 Outlander features the Super All-Wheel Control System, is equipped with magnesium paddle shifters, is built with a lightweight aluminum roof, and has a low center of gravity. The base trim has a 2.4L four-cylinder engine that delivers 168 horsepower. Shoppers can choose the larger 3.0L V-6 with its 230 horsepower output. The base trim has a continuous variable transmission (CVT) system, while the up level GT offers a six-speed Sportronic® automatic transmission with Idle Neutral Logic. The front suspension is MacPherson strut and the rear suspension is multi-link. Outlander offers a very smooth ride, yet the suspension system makes off-road driving much more comfortable than many of the higher priced models currently available. The four sensor, four channel ABS brakes are anti-lock and feature the electronic brake-force distribution technology. The Outlander is somewhat rare in its class in that it offers both two-row and third-row seating. The Toyota RAV4 also can boast this. Third-row seating is standard on all but the base trim Outlander. The air conditioning system includes a micron filter, the steering wheel is leather-wrapped, the second row seats are fold-flat, and the up level trims include a nice 140-watt six-speaker sound system. The multi-information display is well-engineered and easy to program. The 2012 Outlander has a nicely designed mesh grille with a black surround and body color-keyed grille bar. Auto-off halogen headlamps are standard equipment on all trims. The rear LED tail lamps are highly visible in bad weather because of their unique clear lens design. The flap-folding tailgate is also a standard feature on all Outlander trims. Chrome exhaust tips, black roof rails, and rear privacy glass are a few of the niceties included at no extra charge. The up-level GT trim features a power glass sunroof, heated side view mirrors, fog lights, and rain-sensing windshield wipers. 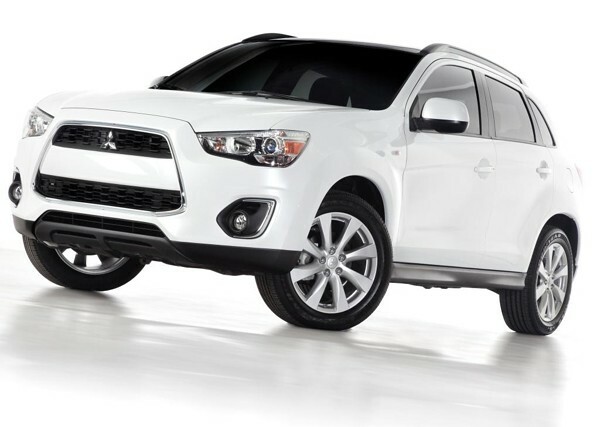 Mitsubishi has incorporated the Active Stability Control into many of its current models. Outlander benefits from this technology, which provides excellent lateral control of the vehicle through a sensoring system. The sensors automatically check the speed and measure it against the vehicle’s response to steering input. Outlander comes equipped with three-point seatbelts. The front seatbelts have pretensioners, and the front seats have active head restraints. The LATCH system for child safety is standard on all Outlander trims. Outlander comes with a full complement of six airbags. These include front dual-stage airbags for the driver and front passenger, side-impact airbags for the front seating area, and side-curtain airbags for both the front and rear seating areas. Sensors detect the rapidity of deceleration and the weight on the driver’s and front passenger’s seat to determine the exact level of front airbag deployment. The Outlander comes with an impressive 100,000 mile, 10-year power train warranty and seven years of anti-corrosion protection. The roadside assistance program is good for five years and unlimited mileage. Those looking for an affordable SUV that gets decent gas mileage will want to take a close look at the 2012 and 2013 Mitsubishi Outlander. For those seeking a more compact, sporty model, buyers might want to consider the Outlander Sport, which is essentially a shrunken version of the Outlander. It is only offered with a four-cylinder engine and is more fuel-efficient. The Outlander Sport has been a strong seller for the Japanese automaker since it debuted in 2011. The IIHS also named the model to its “Top Safety Picks’ list, making it among the safest 2012 SUVs. The Outlander did not make the list. The Outlander is assembled in the U.S. The 2013 model will go on sale by fall 2012. An Outlander Plug-in Hybrid EV is expected to go on sale within the next year. Do you like the styling of the 2013 Mitsubishi Outlander?